The turkeys are coming into our feeders earlier than usual and gobbling up the seeds dropped from the feeders by the smaller birds. The Toms are also becoming friskier as they chase each other and try to impress the females. They have started to display off to the side, but as of yet the girls seem unimpressed. The geese are pairing up also and small groups are flying overhead, calling as they go. The frozen ponds, with no open water for now, are being staked out by the ganders preparing for the upcoming nesting season. Small groups of trumpeter swans are also becoming more active as the daylight hours expand. The finch feeder is seeing a bit more activity but the full force of the migration is yet to come. Filling the thistle feeder now occurs on a weekly basis but soon it will be topped off daily. Male cardinals and chickadees have begun their mating calls each morning, setting up their territories and trying to entice a mate into their lair. A few flocks of starlings have shown up at the feeders also for a quick meal on their way farther north. Hopefully the snowy owls will be able to find their way north after several sightings of them have been made locally following an apparent hard winter in Canada. Very soon the bluebirds will be returning so be sure to get the bluebird houses ready for them! The five deer carcasses that have hung in the trees back in our woods are now picked completely bare and not a morsel of protein or fat remains. With the warmer weather, raccoons have become active and have ventured out and about exploring for food and companionship. We have seen a few scurrying on the roads at night and a few more during the day that have become casualties during their nighttime forays. Over the last couple of days clear and colored bags have appeared on various trees in the woods and even in cities and towns around the area. It is maple syrup time and a sure sign of spring! Cold nights and warm days will produce a bumper crop of sap that will be boiled down and transformed into nutritious maple syrup. There is nothing more delicious than pancakes spread with Wisconsin butter and drenched with homemade maple syrup for a morning breakfast. Warren Irle, who lives just east of Star Prairie, was recently out doing a bit of “sapping” and commented on the snow fleas that were showing up on the snow as he collected his maple sap. 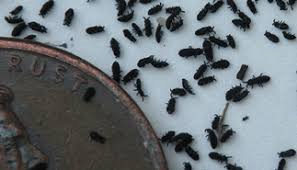 The pepper sized anthropods are actually called springtails and at one time were considered insects but now have been moved into their own Order. 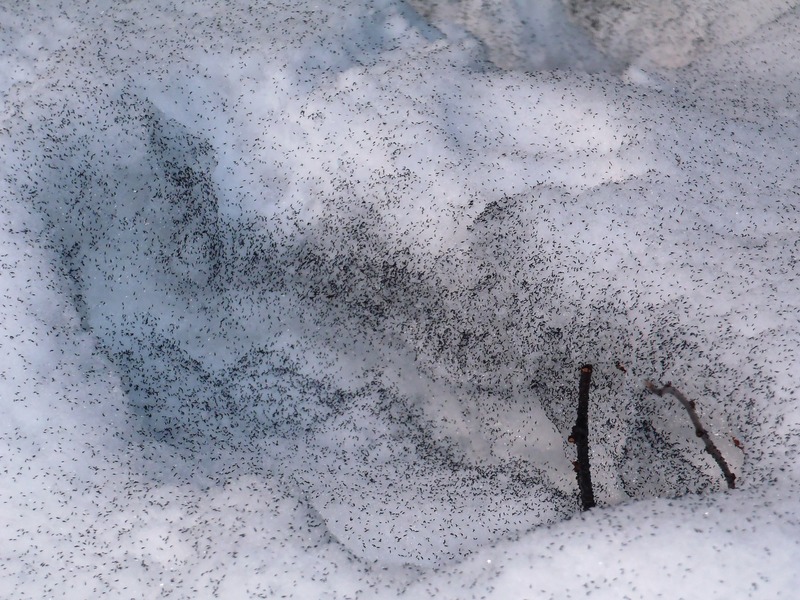 They will emerge this time of year and appear as extremely small black specks on the snow. They can number into the thousands on a square foot of snow and when disturbed will hop long distances despite their small size. They are completely harmless and are actually quite beneficial as they feed on decaying vegetation and help form fertile soil. They don’t freeze during the cold spells because they produce an antifreeze, which is a protein called glycine, that attaches to forming ice crystals and inhibits their growth. Seeing them is a true sign of Spring! Ice fishing should be picking up as the ice begins to melt and the panfish feel an urge to resume feeding activity. The deeper snows have proven a hindrance to ice fishermen this winter at times. Thick ice and reduced accessibility makes one wish for softer water and a warm game fish season opener. The snow depth, as marked by our Wisconsin Badger “W” sign, displayed on a rod in our front yard, has registered a drop of 8 inches. Soon the walking paths will become suitable for foot traffic. The snowshoes and cross county skis can be stored away and the Yak Trax can be removed from boots for another year. This winter season has been fun but it is now time for a change!